What have mathematicians ever done for us? Well, here's one who has saved millions of lives, quite possibly you or somebody you know well. 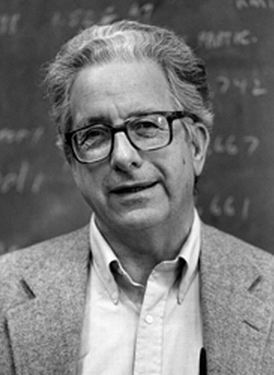 The American statistician Paul Meier died earlier this month, age 87. It is thought that the techniques introduced through his work in medical statistics have saved millions of lives. In the field of medicine, hundreds of new drugs and medical practices come into use each year. Today it is standard that such treatments are tested by a randomised clinical trial. Some patients are given the new treatment, some are given the old; but the key point is that the decision who gets which treatment is made randomly. The randomisation ensures that the statistics coming out of the trial - provided the trial was large enough - give reliable results. it. Often, those patients had the best chances of recovery anyway. Any analysis of the survival or improvement rates would show that the new treatments were better than they really were. In general, the differences are not very big. A new drug may improve the chances of survival rates from, for example, 57 to 59%. But with large numbers of patients involved, statistical techniques can show whether these small improvements are a result of the new treatment. And 2% of a large group of people is still a large number. The randomisation process also introduced a new rigour to medical trials. Only after a randomised trial is a drug or treatment released to the wider medical community. This rigour, and the unbiased evidence resulting from it, is in very large part due to Meier. The polio vaccine trial of 1954 was an early test of the randomised control trial. The trial involved more than a million children and was the largest medical experiment in history. The results showed the benefit's of Jonas Salk's vaccine, which went on to be used widely, and successfully, against the disease. Breast cancer treatment has also benefitted enormously from randomised control trials, with the positive effects of both chemotherapy and hormonal treatments being shown. Survival rates have increased dramatically as a result. Think also of AIDS treatment, drugs for TB and many others. The Kaplan-Meier estimator was a second legacy of this revolutionary statistician. The estimator has many other uses, but in the field of medicine it gives statisticians a simple way of comparing patients’ survival rates after different treatments. The basic idea is that the probability of a patient surviving up to the start of a certain time interval is the product of the probabilities of his not dying during each of many previous intervals. The Kaplan-Meier estimator is now universally used in medical research. The journal article introducing the method in 1958 remains one of the most cited research papers in any field of science, with about 34,000 citations so far.